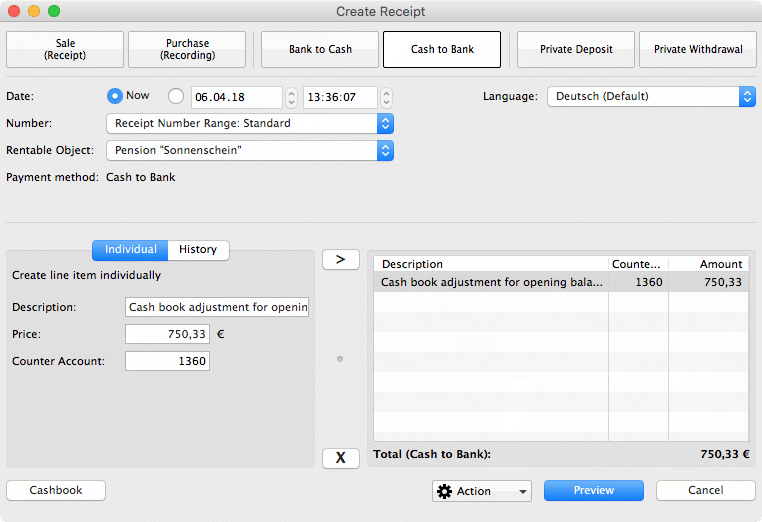 The amounts of all invoices, correction invoices and receipts with the payment method "cash payment" are automatically entered into the Lodgit cash book, sorted according to the date of the respective document. The positive (income) and negative (expenses) amounts are added up consecutively in the "Balance" column. The current cash balance can also be seen at the bottom right of "Total". To adjust this to a certain opening balance, you would have to use>Administration>Create receipt to either make a private withdrawal or deposit or the Cash to Bank transaction or vice versa. As an offsetting account you can also enter your accounting account for transactions there, see screenshot below. Please note that only cash payments are recorded in the cash book, but no credit or EC card payments, for example. Furthermore, no VAT rates are shown. In principle, we recommend that you make a daily cash balance. Further information on creating receipts or the cash book can be found here.